Genre: How to do crazy multiple things in the outdoors and call it sport. Steve Gurney famously won the gruelling Coast to Coast adventure race nine times and has undertaken numerous outdoor challenges throughout the world - biking, running, kayaking, mountaineering. He continues to find new extreme challenges as well as speaking to many groups of all ages. He also in great bravery had his chest waxed for Dancing with the Stars, that deserves a read of this book if nothing does. Adventure Sport is big in our school, we are really good at it, we are regular successful participants in the Sir Ed competitions. This book will be a great place for our Yr 9/10 students to get heaps of info about Adventure Sport racing. How do you swim in open water? How do you read a compass? How do you fix a puncture? 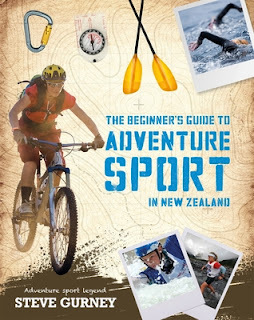 Instructional and highly illustrated, this is a beginner's book of adventure sport for all ages. It features pursuits to make the most out of New Zealand's great outdoors and get you all set up for a lifetime of adventure. Learn the basics of open-water swimming, river kayaking, trail running, mountain biking, climbing and snow sport in New Zealand, then put it all together to compete in our famous multisport and adventure races. With an emphasis on safety throughout, this book has important information on the right gear you'll need for the right pursuit and the essentials of survival in unpredictable environments.